The implantation of 5 MeV silicon and germanium ions into silica forms a 4 μm thick optical waveguide near the substrate's surface with a refractive index change related to that of the delivered damage. 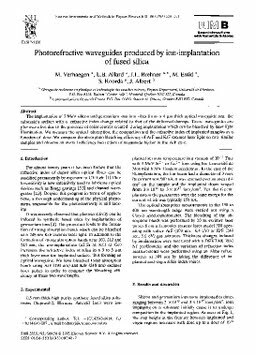 These waveguides are photosensitive due to the presence of color centres created during implantation which can be bleached by laser light illumination. We measure the optical absorption, the compaction and the refractive index of implanted samples as a function of dose. We compare the absorption bleaching efficiency of ArF and KrF excimer laser light on two similar samples and observe an overall efficiency two orders of magnitude higher in the ArF case.